The time for talking is long gone. On The Walking Dead Season 8 Episode 16, the war between Rick and the Saviors will come to a dramatic conclusion, and we should probably expect a whole lot of death and destruction. 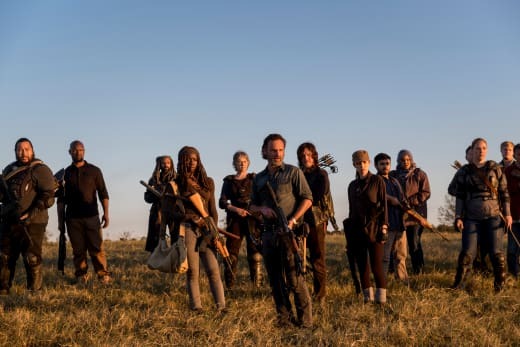 As teased on The Walking Dead Season 8 Episode 15, Negan is not ready to let his big feud with the Hilltoppers come to an end without more blood being shed. Also, he wants to find out what Dwight has been telling those against him, so that should be fun. When the fight kicks off, Eugene will be forced to confirm whether he has truly left his former team behind. In scenes from the official prom, we see the bullet maker turning a gun on Gabriel, but will he really be able to take someone out? 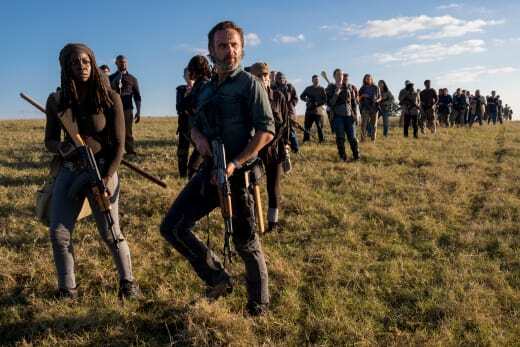 The All Out War segment is expected to come to an end on The Walking Dead Season 8 Episode 16, but given the deviations from the comics of late, there's no telling which direction the AMC series will go. What we do know is that Fear The Walking Dead Season 4 debuts right after the episode concludes. Have a look at the full teaser below, and join us in the comments with your thoughts on it. The Walking Dead continues Sunday on AMC.